For just a moment, I'm going to pretend to be in Russia, and I'm going to pretend to jump into my car and take a drive to ... oh, let's make it the country, so I head out, drive through streets, then to highways, my car-cam always on (for insurance reasons — see below) and that's when crazy things start to happen. And when I say crazy, I mean, totally off the charts, ohmygod, this-isn't-happening kind of crazy. Why Did So Many Russian Drivers Get Such Great Meteor Videos? Two immediate questions: Is this occasional or typical behavior? And why does everybody seem to have a working camera on their dashboard? Videos like this are a window into different cultures, and this window has made me really curious. Marina Galperina, who blogs for Animal New York, says "dash-cameras" are very common in Russia. You need them to prove or defend insurance claims. "In Russia, everyone should have a camera on their dashboard. It's better than keeping a lead pipe under your seat for protection (but you might still want that lead pipe). "The conditions of Russian roads are perilous, with insane gridlock in cities and gigantic ditches, endless swamps and severe wintry emptiness on the back roads and highways. Then there are large, lawless areas you don't just ride into, the police with a penchant for extortion and deeply frustrated drivers who want to smash your face. "Psychopaths are abundant on Russian roads. You best not cut anyone off or undertake some other type of maneuver that might inconvenience the 200-pound, six-foot-five brawling children you see on YouTube hopping out of their SUVs with their dukes up. They will go ballistic in a snap, drive in front of you, brake suddenly, block you off, jump out and run towards your vehicle. Next thing you start getting punches in your face because you didn't roll up your windows, or getting pulled out of the car and beaten because you didn't lock the doors. "These fights happen all the time and you can't really press charges. Point to your broken nose or smashed windows all you want. The Russian courts don't like verbal claims. They do, however, like to send people to jail for battery and property destruction if there's definite video proof. That is why there's a new, growing crop of dash-cam videos featuring would-be face-beaters backing away to the shouts of 'You're on camera, f- - -er! I'm calling the cops!' "
Not too long ago, she writes, there were gangsters who'd create small "accidents" by dashing in front of slow-moving vehicles and feigning injury. "Bystanders" (really co-conspirators) would then threaten the driver and demand cash payments. 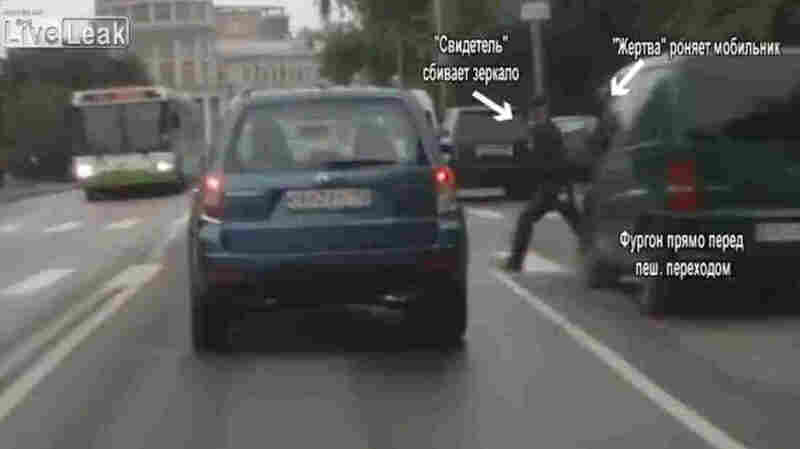 When Jason Kottke ran the Russian accident video on his blog last week, someone sent him a "Phony Accident" compilation video, where you can see (because they are identified in oval highlights) the perps waiting to become victims and then throwing themselves in harm's way. This video, in its way, is as astonishing as the first one, though Cory Jones, the reporter at Mandatory who describes what's going on (the video is in Russian, but the images are vividly obvious), suggests that having a camera in your car, and saying so, often makes the scam artists go away. If you want to see these criminals doing their derring-do (and when you see them fall over, hit the ground, looking dead, they're not, not at all), here's the video. The moral of this story? 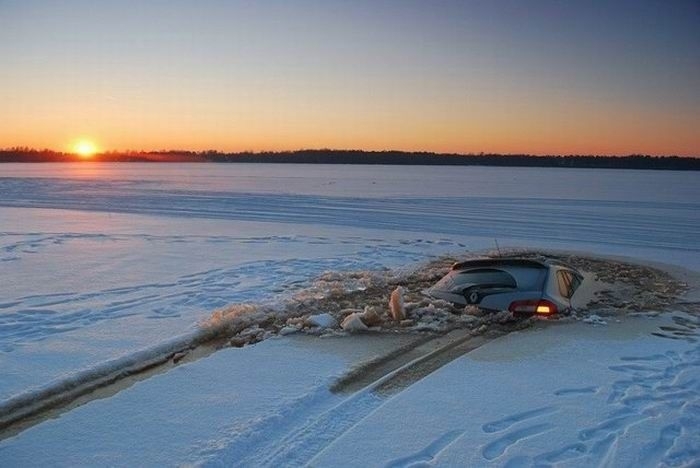 There are obviously better places to go for a drive than Russia. Most places on Earth would probably qualify, but it's the details, the dash-cams, the scam artists, the drunkenness, the anything-can-happen quality (how about that fighter jet roaring up the highway at about 100 feet off the ground?) that remind you, different places on Earth are still richly, oddly, troublesomely, different.